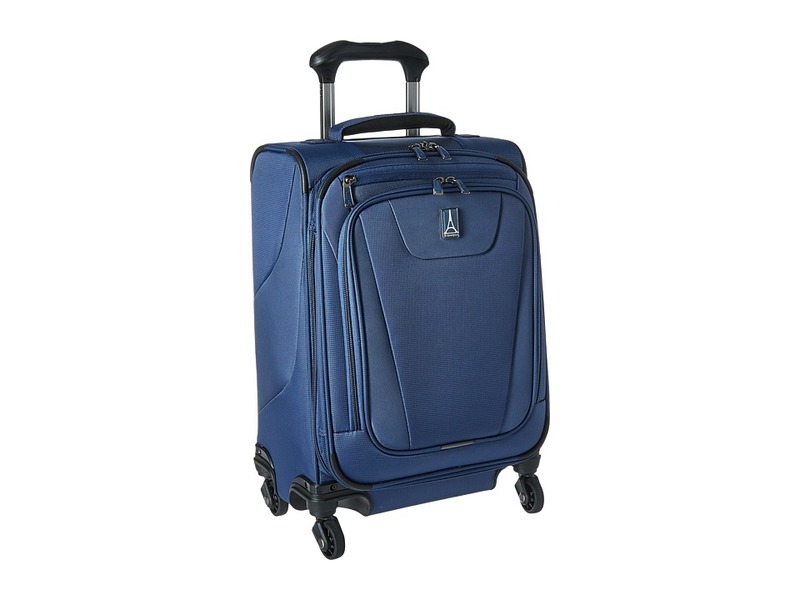 The Maxlite 4 International Carry-On Spinner by Travelpro is a perfect choice for the frequent flyer! Made with water and stain resistant coated polyester fabric. Features a patented Contour Grip design with rubberized touch points specifically engineered for spinner model use extendable trolly handle as well as a padded top and bottom grab handle. Airline-grade aluminum handle locks in 2 positions, 38 in and 42.5 in. Front zippered pocket for easy access items. Expands an additional two inches for maximum storage. Spacious interior provides a full length lid pocket as well as a zippered mesh pocket and adjustable tie-down straps. Features a polypropylene honeycomb construction frame and EVA foam for ultra light travel and durability. Four 360&amp#176 rotating spinner wheels offer easy portability with a unique bottom tray that aligns and stabilizes wheels for effortless maneuverability and enhanced durability. Imported. Measurements: Width: 14 in Depth: 9 in Height: 21 in Weight: 5 lbs 15 oz Proposition 65 WARNING: This product contains chemicals known to the State of California to cause cancer and birth defects or other reproductive harm. 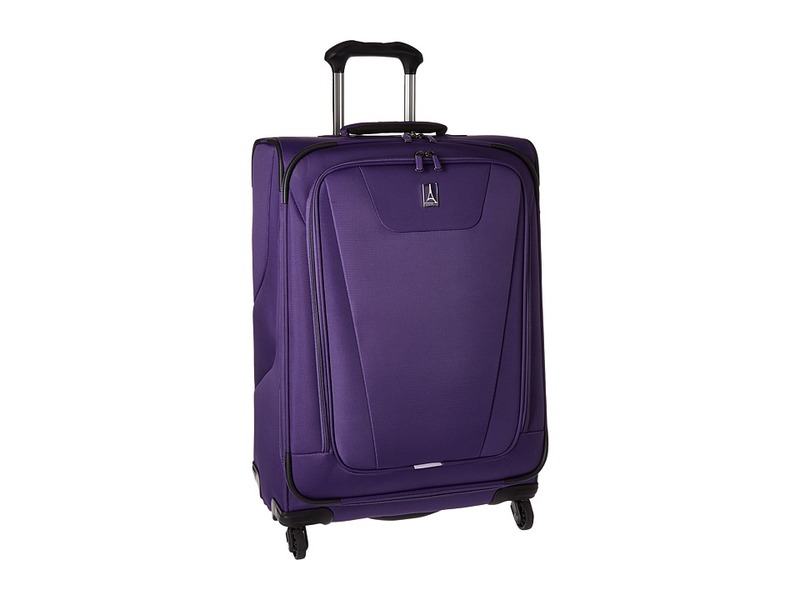 The Maxlite 4 21 Expandable Spinner by Travelpro is a perfect choice for the frequent flyer! Made with water and stain resistant coated polyester fabric. Features a patented Contour Grip design with rubberized touch points specifically engineered for spinner model use extendable trolley handle as well as a padded top and bottom grab handle. Airline-grade aluminum handle locks in 2 positions, 38 in and 42.5 in. Front zippered pocket for easy access items. Expands an additional two inches for maximum storage. Spacious interior provides a full length lid pocket as well as a zippered mesh pocket and adjustable tie-down straps. Features a polypropylene honeycomb construction frame and EVA foam for ultra light travel and durability. Four 360&amp#176 rotating spinner wheels offer easy portability with a unique bottom tray that aligns and stabilizes wheels for effortless maneuverability and enhanced durability. Imported. Measurements: Width: 14 in Depth: 9 in Height: 21 in Weight: 5 lbs 14.4 oz Proposition 65 WARNING: This product contains chemicals known to the State of California to cause cancer and birth defects or other reproductive harm. 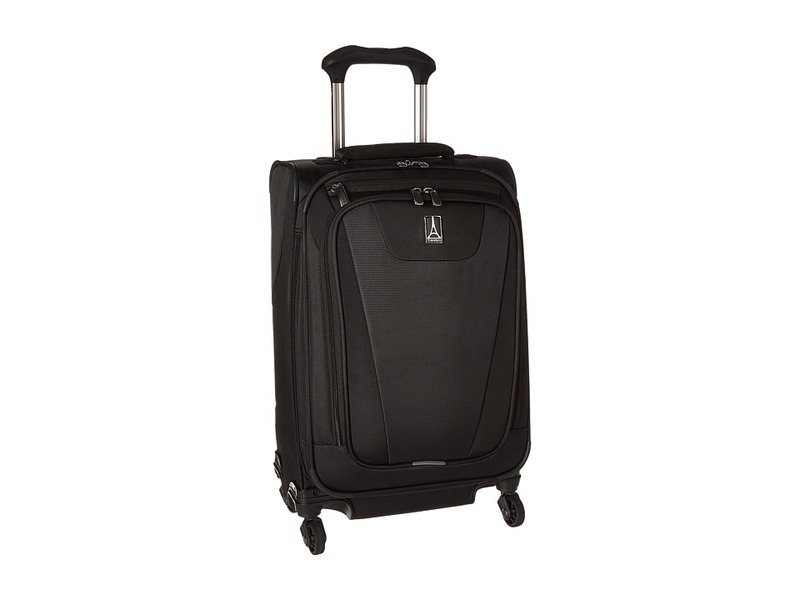 The Maxlite 4 29 Expandable Spinner by Travelpro is a perfect choice for the frequent flyer! Made with water and stain resistant coated polyester fabric. Features a patented Contour Grip design with rubberized touch points specifically engineered for spinner model use extendable trolley handle as well as a padded top and bottom grab handle. Airline-grade aluminum handle locks in 2 positions, 38 in and 42.5 in. Front zippered pocket for easy access items. Expands an additional two inches for maximum storage. Spacious interior provides a full length lid pocket as well as a zippered mesh pocket and adjustable tie-down straps. Features a polypropylene honeycomb construction frame and EVA foam for ultra light travel and durability. Four 360&amp#176 rotating spinner wheels offer easy portability with a unique bottom tray that aligns and stabilizes wheels for effortless maneuverability and enhanced durability. Imported. Measurements: Width: 20 1 4 in Depth: 12 in Height: 29 in Weight: 9 lbs Proposition 65 WARNING: This product contains chemicals known to the State of California to cause cancer and birth defects or other reproductive harm. 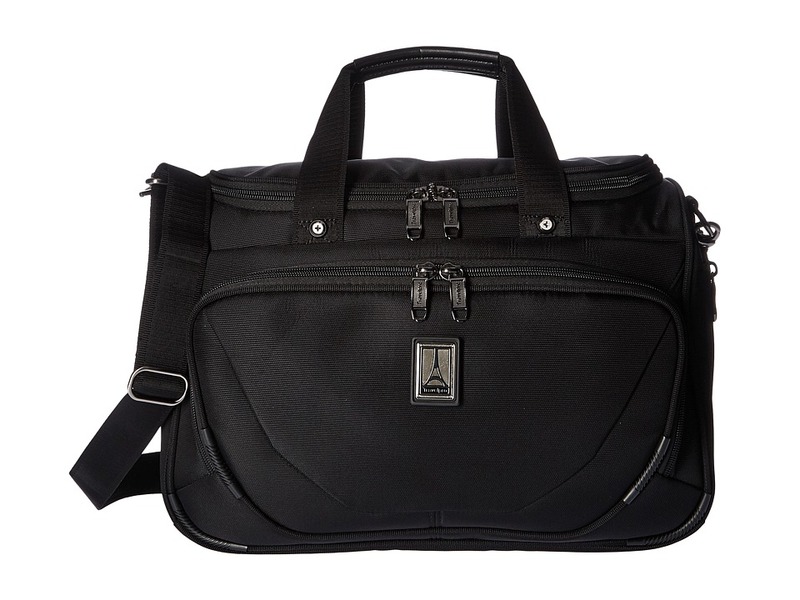 The Travelpro Crew 11 Deluxe Tote is the perfect business trip companion, rest assured that this bag can withstand the test of travel. Made of durable ballistic nylon with DuraGuard coating for stain and abrasion resistance. Supra zipper head zip closure. Padded, adjustable shoulder strap and dual top carry handles trimmed in leather. Ergonomic high-tensile-strength zipper pulls. Front zip pocket, perfect for boarding passes and loose items as well as a side zip compartment. Interior features one zip pocket and one slip pocket. Rear exterior strap allows you to add tote to rolling luggage. Imported. Measurements: Width: 15 1 2 in Depth: 7 1 4 in Height: 10 in Weight: 2 lbs 0.2 oz Proposition 65 WARNING: This product contains chemicals known to the State of California to cause cancer and birth defects or other reproductive harm. 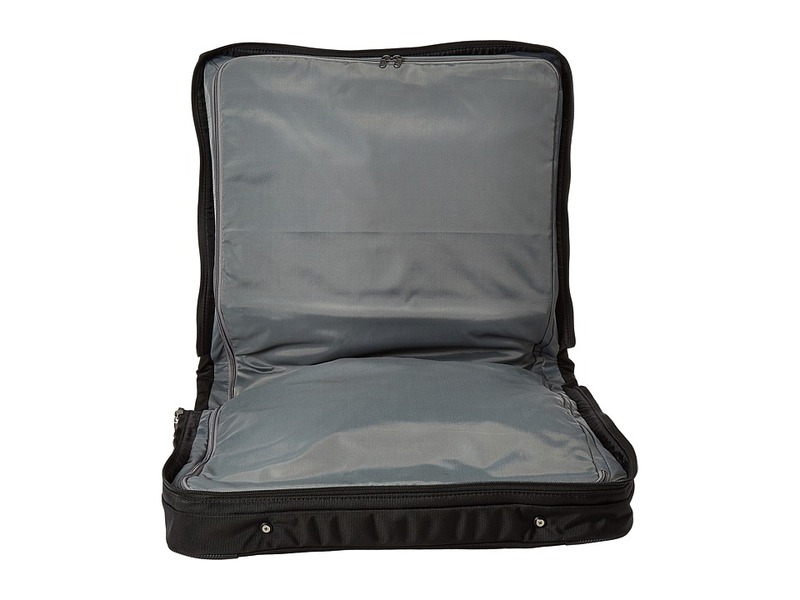 This Bifold Garment Bag is part of the Travelpro Crew 11 Collection. A poised style to keep your look fresh and professional on the go, the Travelpro Crew 11 Bifold Garment Bag. Bag made of quality ballistic nylon with Duraguard protection. Top carrying handle with detachable, adjustable crossbody strap. Exterior front zip pocket. SUPRA Zipper heads made to resist damage from daily use and abuse. Fully lined zipper closure. Interior zipper and mesh compartments. Interior elastic strap to keep garments in place. Imported. Measurements: Width: 22 in Depth: 7 in Height: 20 in Proposition 65 WARNING: This product contains chemicals known to the State of California to cause cancer and birth defects or other reproductive harm. 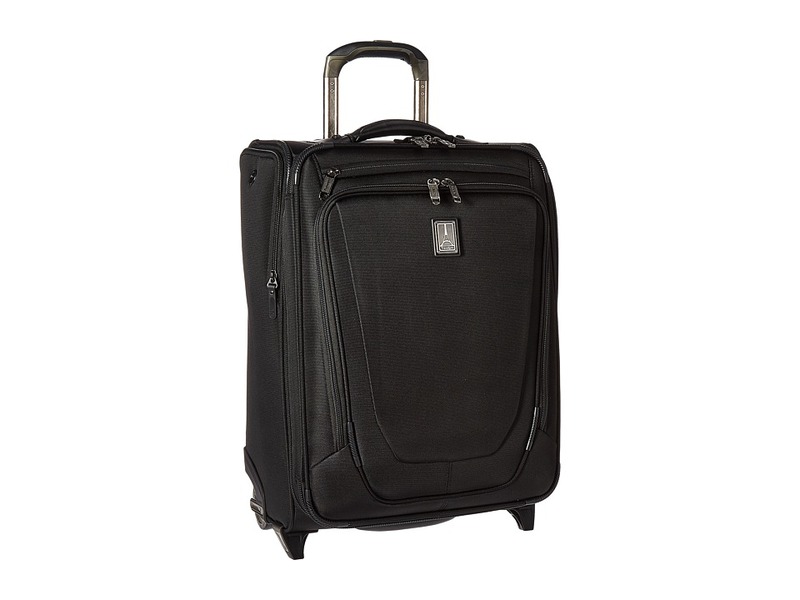 The Rolling Tote is part of the Travelpro&amp#174 Crew 11 Collection. 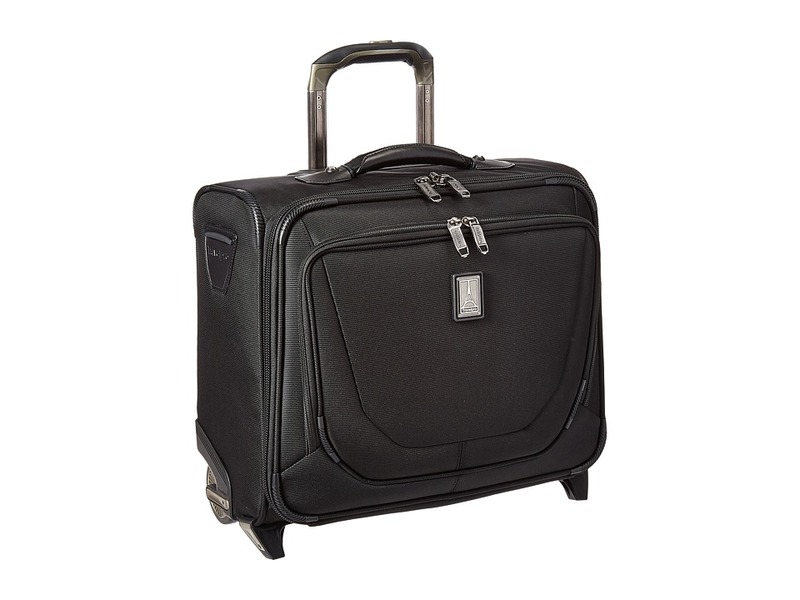 Make sure to fulfill all of your business needs while on the road with the convenient Rolling Tote by Travelpro. Laptop compartment accommodates laptops up to 15.6 inches. PowerScope handle system minimizes wobble when fully extended. Handle features contoured grip. Carry handle at top and bottom for easy lifting. Durable nylon fabric with water repellant coating. One front exterior pocket for quick-grab items. Interior laptop sleeve is padded for the safety of your electronics. Built in business organizer keeps you on the go! Two skid bars at bottom and back of bag protect from scuffing. Sealed, ball-bearing inline skate wheels. Imported. Measurements: Width: 16 1 2 in Depth: 8 1 2 in Height: 13 in Weight: 6 lbs 10.56 oz Proposition 65 WARNING: This product contains chemicals known to the State of California to cause cancer and birth defects or other reproductive harm. Part of the Travelpro&amp#174 Crew&amp#8482 11 Collection. 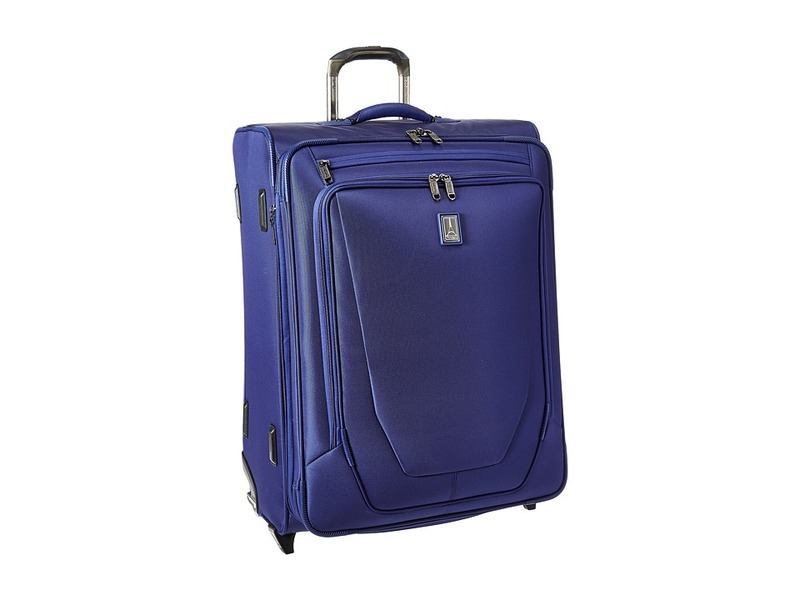 Be clear to move around the cabin with this spacious luggage piece by Travelpro. Made of 2000D Twist Nylon fabric with Duraguard fabric protector. PowerScope handle system minimizes wobble when fully extended. Features multiple stops at 38 and 42.5. Contour Grip design with TPR touch points specifically engineered for spinner model use. Reinforced SUPRA zipper heads ensure reliably over the long haul. Carry handle at top, bottom, and side for easy lifting. Interior features a wet pocket, perfect for toiletries or sweaty gym clothes and side mesh zipper pockets. Main compartment can expand 2 for big loads. Two front exterior pockets for accessories. Extra-wide interior with adjustable hold down straps to keep clothing in place. Full length interior lid pocket with zip closure. Dual Spinner wheels rotate 360&amp#176. Imported. Measurements: Width: 15 in Depth: 7 in Height: 20 in Weight: 7 lbs 0.5 oz Proposition 65 WARNING: This product contains chemicals known to the State of California to cause cancer and birth defects or other reproductive harm. 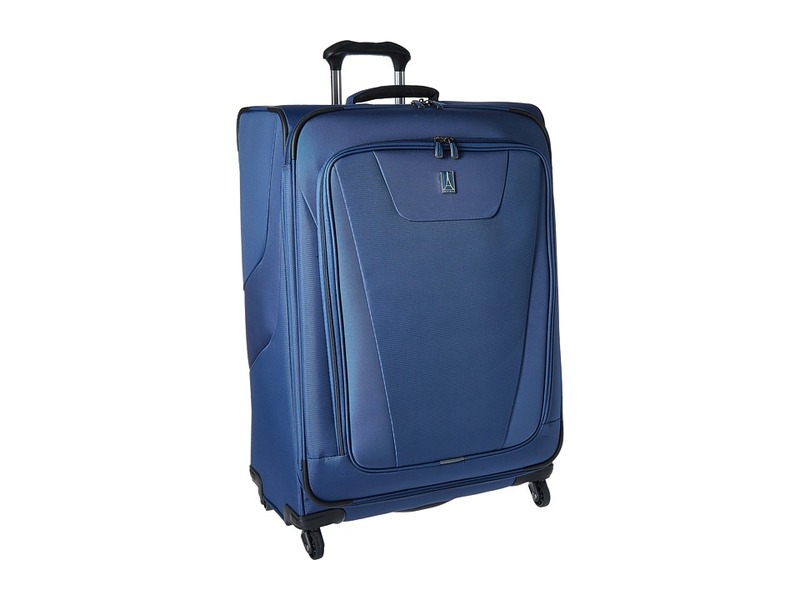 This Travelpro 26 Expandable Rollaboard Suiter is part of the Crew 11 Collection. It~s time to pack up the cool Travelpro Crew 11 Expandable Rollaboard Suiter and jet set to a new place. Case made of quality ballistic nylon with Duraguard protection. PowerScope handle system minimizes wobble when fully extended. Features multiple stops at 38, 40 and 42.5. Reinforced SUPRA zipper heads ensure reliability over the long haul. Two exterior front zip pocket. Leather handle at top and side with structured handle at base. Interior features a wet pocket, perfect for toiletries or sweaty gym clothes and side mesh zipper pockets. 2 option for expansion when more space is needed. Interior elastic straps to secure belongings. Dual Spinner wheels rotate 360&amp#176. Imported. Measurements: Width: 18 1 2 in Depth: 11 1 2 in Height: 26 in Weight: 8 lbs 12.8 oz Proposition 65 WARNING: This product contains chemicals known to the State of California to cause cancer and birth defects or other reproductive harm.